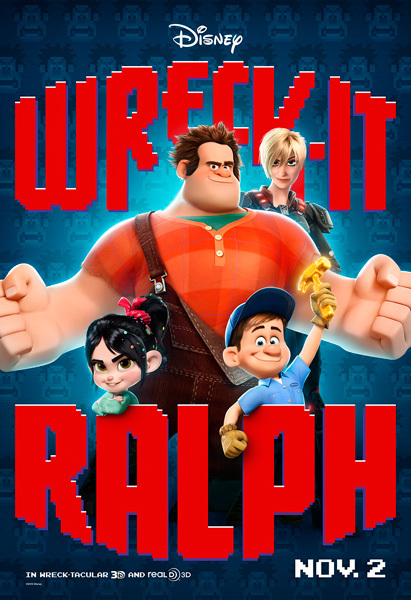 Background: I had the chance to watch an advance screening of Wreck It Ralph weeks ago before the Nov. 2 premiere. I watched the movie in 3D, which really did not add or subtract much from the viewing experience. The beginning portion of the movie focuses heavily on explaining how Ralph is disappointed being the villain since he can’t earn a medal and stand happily at the top of his building. Ralph can’t earn a medal since he is a villain. So Ralph decides to visit another arcade machine, earn a medal and return to show his worth. Moral: villains never get the girl or the glory. Real life message: If you have a dead-end job, you are stuck with it, enjoy the small moments of pleasure you get. Video game and arcade characters create nostalgia for the first fourth of the movie to bring in the male audience. Then the bait and switch to Disney’s cutesy Sugar Land where childish jokes meet Mario Kart racing. The start of the movie pours on the fanservice with many, many video game cameos. We have the DDR machine girl announcing all the humans have left the arcade. Ken and Ryu stop battling and agree to go get a drink. Later on in the Tapper arcade, we can see them sharing a drink of root beer as Ralph is being served by the Tapper bartender. 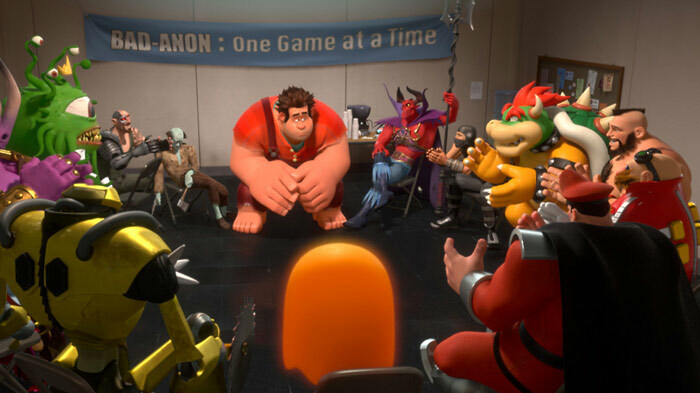 The villian support group session features the orange Pac Man ghost, Bowser, Zangief, M. Bison, Doctor Robotnik, Kano and others. Sadly, there isn’t any more Nintendo villain cameos in the movie. The Capcom characters get the best dialogue. M. Bison asks Ralph if he is going “Turbo”, which is priceless since Capcom always makes a turbo edition of Street Fighter. Zangief mulls over why he must be a villain and decided he must be a villain because no one else is going to squeeze the life out of his opponents with their thighs. In the Game Central Station, we see Q-bert is stranded there since his arcade machine has been disconnected. Paperboy is also there on his bike. Frogger is also seen crossing the station. The biggest cameo in the movie is when Sonic the Hedgehog introduces a huge movie plot point via a Game Central announcement. He states that characters do not respawn if they die when outside their arcade cabinet. I’m going to rate the characters in terms of how much power they have over the arcade universe. OP stands for "over-powered". A score of 0 means the character is normal and can’t affect arcade worlds. A score of 10 means the character is super OP in their arcade machine and/or can alter other arcade universes. Ralph (3)- His powers are climbing buildings, pounding surfaces flat and moving his hands really fast. He also falls off buildings a lot. His powers are not universe or game breaking, so his OP factor is 3 = normal. Fix-It Felix, Jr (1), Fix-It Hammer (7)- Fix-It Felix Jr. by himself can only move, jump, DANCE and talk in Q-bert-ese. His fix it hammer can repair his wounds. The hammer’s power must be respected as it could potentially fix anything. Gene, inhabitant of Fix-It Felix, Jr (0) – He can only move in really cool frame animations like the rest of the city dwellers of Fix-it Felix. Gene really has no powers whatsoever except for serving as the early protagonist to get Ralph on his adventure. King Candy (10) – King Candy rewrites game code using the Konami Code. The Konami Code is the equivalent of godlike power. This means he can effectively kill characters, wipe their memory or do anything game related like get 99 lives. I’m guessing he has some restraint with tinkering with the code since he just wants to race and this is a Disney movie. Vanellope von Schweetz (9) – A “glitch”who can pixelate and teleport. She is able to cheat her arcade game and get the best car in Sugar Rush with Ralph’s help. The only reason she isn’t rated a 10 is because she can’t leave her game (glaring and annoying plot point) and her memory was fractured. A human choosing Vanellope as a racing character still gets the most OP character in the game with teleports and the fastest car. Sour Bill (1) – He’s sour and a character puts him in his mouth. Sour candy is worth a point. Sergeant Calhoun (5) – I had to look her name up since she is a generic soldier with “the most tragic backstory ever.” During her marriage, a Cy-bug crashes through the window and eats her husband. She has a mini-gun and takes down a lot of the Cy-bugs during the movie with various guns. Guns in a Disney movie are impressive, so she gets an above average score. Cy-bugs (10) –This is what happens when Ditto's breed with Space Invaders. They can turn into anything they eat. If all it takes is for a mindless character to enter another arcade cabinet and multiply, we would have multiple times where entire arcades are threatened. Don’t even start thinking about arcade machines that are connected to the Internet, it only opens a can of worms. Or worse, what happens to the characters when humans reach kill screens like in Pac-Man!!! Plot Loopholes: The arcade universe has some crazy rules! So I’m taking the arcade universes as they exist in the movie. Arcade characters can leave their machines when the arcade is closed and there are no humans to see their antics. This works just like Toy Story. The characters can travel to other game worlds via the surge protector’s Game Central Station which acts like a transportation hub to other arcades. The surge protector customs agent is useless in making sure foreign arcade characters and props stay in their universe (like when Ralph removes the Pac-Man cherry early in the movie). Characters must return to their arcade machine or else their machine is going to be lacking those characters when people try to play them. So far this makes sense, now here’s where it gets complicated. The arcade universe via the Sonic the Hedgehog video screen says if a character “dies” in another machine, they don’t respawn. If a character isn’t in their original arcade machine, they are considered going “turbo” (rogue) by other universe characters. This puts the entire machine at risk as the outside world human operators perceive the arcade machine is malfunctioning. If an arcade machine is removed from the arcade, the characters effectively die. This is a doomsday scenario considering if one character goes turbo like Ralph is suspected, then the rest of the arcade characters either face their plug being pulled or they choose to live in the surge protector, their game over. Would you choose death or purgatory? A racer named Turbo chooses a third option. When his game faced the plug being pulled, Turbo decided to enter another game to keep racing. He interferes with the gameplay while humans are playing. This should have caused humans to panic that the game characters are “alive.” Instead, the staff just put up a sign saying the machine is just "out of order" before the machine is removed. Now the arcade characters definitely know character like Turbo can enter their arcade universe and potentially corrupt their world. Yet no characters were freaking out and closing their doors to other game characters. At the end of the movie, other foreign characters are invited to live in the Fix-It Felix machine for absolutely no logical reason. Instead of the humans pulling the plug when they see characters like Q-bert in the wrong machine or more appropriately freaking out, everyone wants to play it since it’s popular and nostalgic. Suuuuuure. The arcade copyright lawyers would put the kibosh on that quickly. Finally Vanellope von Schweetz is a super powerful character who can do things that contradict the laws of the arcade universe. First, she can play the Sugar Rush minigame as a character in the game to customize her racer. I found this scene very entertaining with her pretty much destroying everything and still ending up with the best car covered with candy. Vanellope von Schweetz can’t leave her arcade since she is considered a glitch. Once her memory has been restored, she should not have the ability to glitch while racing. So then I guess her glitch is really her special ability. Then she still shouldn’t be able to leave her arcade cabinet at the end of the movie to attend the marriage in Hero’s Duty. Also for some reason, Ralph makes it seem like he can't see Vanellope again except for glimpses before he is tossed from the building roof. If all she has to do is finish the race and the game will restart, why is Ralph so concerned with fighting the Cy-bugs? Just push that little girl across the finish line, let the game reset and then go from there. 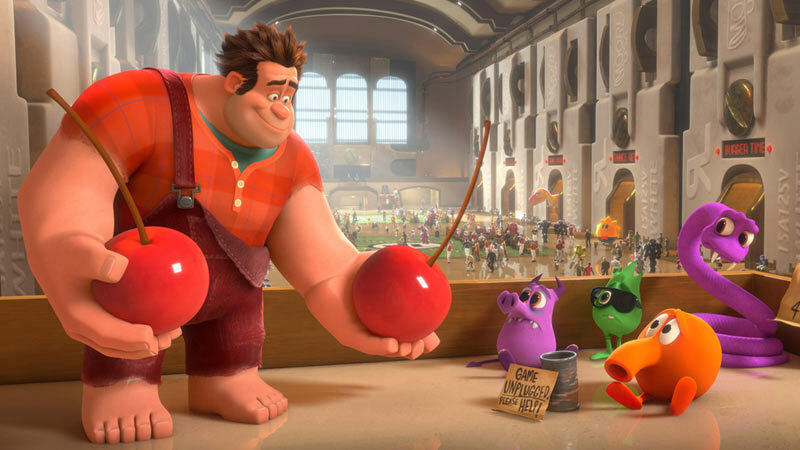 The best parts of the movie are the beginning character cameos, Hero’s Duty, Ralph’s disgust with Sugar Rush’s candy world, the unexpected Rainbow Road homage and frightening final boss. 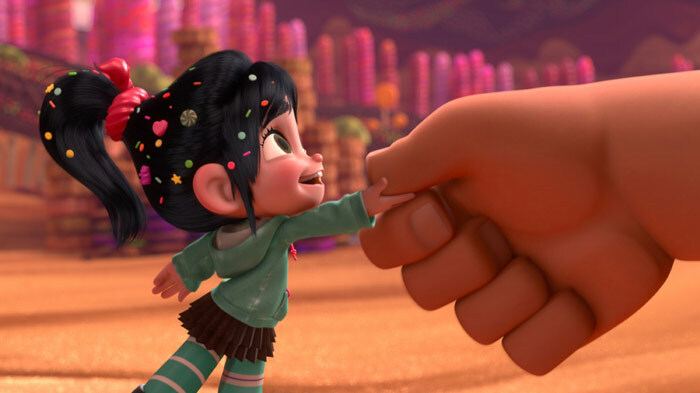 The worst parts are Vanellope von Schweetz’s childish jokes about “dooty”, the unnecessary focus on Mario kart racing in Sugar Land for most of the movie and the ending with Ralph returning pretty much to the same way of life. The movie looked stunning. The arcade cameos were spot on. I laughed at a lot of the unfunny moments. I would recommend video gamers go see the movie for the cameos and smart design. Just ignore most of the Sugar Land portions of the movie. Come for the throwback to Donkey Kong, stay for the brief arcade cameos. I have watched this film and it was a terrific story. I like the old games being featured here.